No, I am not referring to a joke..... Nono means No-Nonsense. This project can be found browsing the internet in many forms. Tweaking is relative easy, so many variations can be found. One of them is Scott Nixon, who has built one and went commercial with it... This can be promising!! 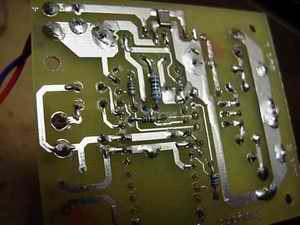 Looking at the pcb, which is only 6 x 8 cm, and counting the parts, I really became curious! The only "extra" part that had to be made, was the powersupply. Not that difficult... How will this sound compared to my Cyrus? The incoming digital signal. On the picture still connected using hook-up wire (wrong!)... This is replaced by 75ohm coax. The little capacitors are BlackGate N, the blue square ones are MKT, used as output capacitors. 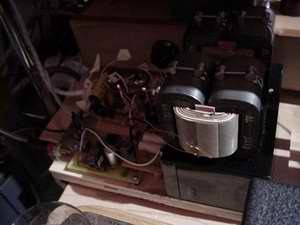 These are replaced by Rubycons, 4.7mF/25V bi-polars, rebuilt using beeswax.... (yes!) When arrived, I will replace these by BlackGate 4.7mF/50V Non-polars (N-type). Yes! It works... AND?? 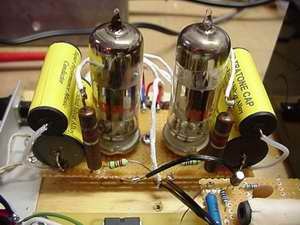 Is the result the same as comparing well designed home-made tube amplifiers to off-the-shelve factory-made tube amplifiers? I mean, in designing and building your own amplifier you have a very big advantage compared to factories... You can easily adjust the design and component-choice to your liking. Influences of your listening room can be optimized this way. Also you won't be prejudiced because some reviewers have been measuring-before-listening... Mostly man can not be objective, or at least it is very difficult: judging a component whilst already knowing what its weaker points are... Alright, I didn't measure this dac, I "just" listened to it - and what I hear is good!! Well defined, good tonal balance, natural sound and no sibilant highs! This is not what I expected! I suspected it could be good, but this good? Maybe the minimalist NonoDac and the SLA-battery are a perfect couple? I don't know.... All I can say is that it is very well worth the 125Euro. Try it! You'll at least be amazed! Need some more information about a non-oversampling dac? 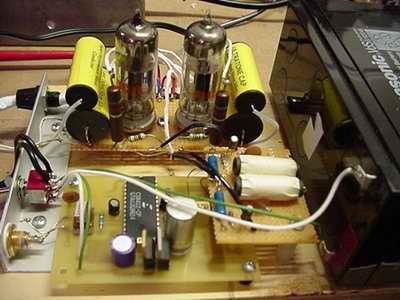 Click here to see the "Dac-Attack", almost the same project... Note that the TDA1543 is set to 9Volts to make almost 2Volt output possible.. 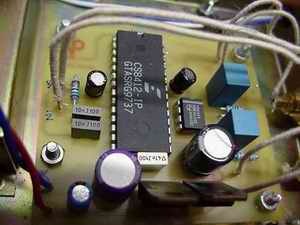 The original Nono-Dac's output contains a coupling capacitor and a resistor to ground. The sound quality is primarily determined by the coupling capacitor, the one used is a BlackGate NX in Super E-cap configuration. 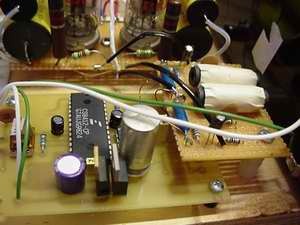 However it is advisable to parallel a low value capacitor (about 3.3nF) to the resistor to create a filter which prevents high frequency coming through the system. Typically a Nono-Dac (or every non-oversampling dac) will send high frequency information (44.1Khz sampling harmonics) into the system... When played very loudly this may harm tweeters so be warned! Also any non-oversampling dac will have a decreasing frequency response off about -3dB at 20Khz, the question is: do we actually miss that information...? This man has dealt with that problem and I am sure that many other have also... He is mentioned because I came across some information surfing the www about this "problem". The schematic contains a ECC88 preceded by a so called SINC-filter. 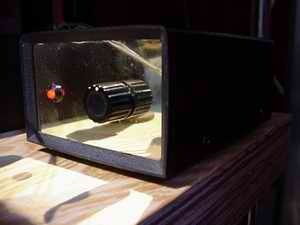 This filter takes care of the HF leaking in and equalizes the response up to 20Khz, really interesting!! (click here for the schematic). 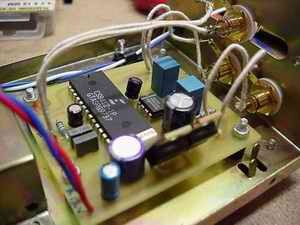 This schematic is built by me and put as output for the Nono-Dac. I had one extra (identical) Nono-Dac so an A-B comparison with the original was possible.... Well, the extra output stage was slightly more precise and just a bit more elegant sounding (less raw). Not a big difference but a minor improvement and that is what we are looking for, or not? I'm not fond of the ECC88.... In my opinion has this tube a too characteristic sound, meaning not natural sounding and somehow projecting a too compressed soundstage. Swapping for other brands (from Telefunken up to JJ) did not solve this, although remarkable differences were noticed in favor for the NOS types. Why not using another tube? I mean, the ECC88 has a Rp of about 2.6K and a mu of 33. In this stage lots of feedback is used to reduce effective output and lower output impedance. Talking about this Pieter from Tribute draw my attention to the 12B4A, a low mu triode originally designed for use in televisions. Its low Rp of about 1KiloOhm makes it extra interesting. The SINC-filter was slightly adjusted (100K load put to ground i.s.o. grid) and the 12B4A put in at a 230V B+ running at 15mA. This results in a cathode voltage of 18V, meaning a "huge" -18V seen by the dac... 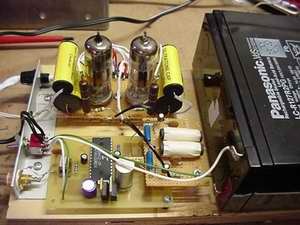 However this adjustment is neccesary to put the tube into its linear part of the curves and this turned out not to be a problem at all, although the output of the dac is "only" about 1Volt effective. Now for the sound! Bingo! The same upgrade but far more better noticeable! Sound and timbre are fine, stereo-depth is okay too but most of all imaging is improved! Every detail is better distinguishable and has its own timbre: Fantastic! A real upgrade for the Nono-Dac.